I watch Gilmore Girls EVERY DAY (and I have season 2 on my laptop so that when I travel, I have no excuse to be without--I've seen every episode no less than 16 times) and I'm completely obsessed with it, The Mindy Project, Scandal and Cutthroat Kitchen. I'm the go-to lady whenever anyone has a cooking or culinary question. I rarely get invited to dinner because people think I'll turn up my nose at their "regular food" and people are shocked to find out that I really, really enjoy the overcooked, burnt burgers at Cook-Out and I think K & W has the best macaroni and cheese on the planet. I'm very much a people person and the words "social butterfly" are a poor description of how I can work a room and make a deep, personal connection with everyone before I leave but I really prefer to have one-on-one conversations and alone time with people I care about. I have very hermetical private life at home. Once I take off my bra, that's it. I'm not leaving again unless I have to! I hardly ever workout. I should, but I don't. I might go to one yoga class a month or do a 20-mile bike ride and then I pat myself on the back for doing so much exercise at one time and then accidentally on purpose forget I own running shoes for the next three to five months. I pretty much just told you all of that because I've felt as if I've lost my voice a little. I've been so busy building my brand, travelling and completing professional goals, I've let my voice slide a little. No more! It's about time for me to take my yearly hiatus, but I want to share some really solid recipes before that happens. This next recipe is pretty $%&*ing solid. Ashford & Simpson solid. Since I've been travelling a lot, I've been collecting those packages of Biscoff cookies that Delta Airlines gives to you. Well, they don't give you anything... you've paid for them. I always ask for 2 and if the flight is long enough for a second service? I ask for two more. I'm sure I could have purchased a package from biscoff.com, but what's the fun in that? And speaking of fun: Biscoff, speculoos and cookie butter are the "new" Nutella that everyone is going crazy over. 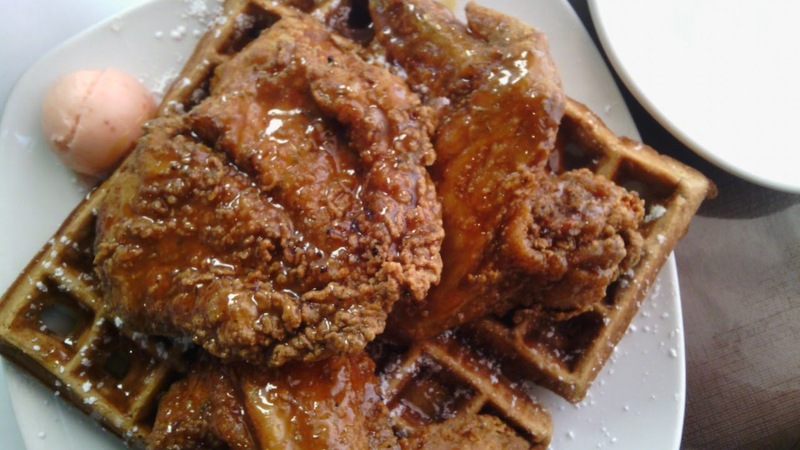 Let's start a trend with chicken & waffles too, okay? Sprinkle chicken with 1/2 tsp. salt and 1/2 tsp. pepper. Place 1/2 cup flour in a shallow dish. Whisk together eggs and hot sauce in a second shallow dish. Stir together Biscoff crumbs, cracker crumbs, cornstarch and remaining 3/4 cup flour in a third shallow dish. Dredge chicken in flour, dip in egg mixture, and dredge in cracker mixture, pressing to adhere. Place chicken breasts to rest on a cooking rack while you heat the oil. Pour oil to depth of 1 inch into a 10-inch cast-iron skillet; heat to 360°F. Fry half of chicken 3 to 4 minutes. Turn and fry 2 to 3 minutes or until golden brown and done. Repeat procedure with remaining half of chicken. Place chicken on a sheet pan lined with paper towels to drain oil. Put oven rack in middle position and put a large metal cooling rack directly on it. Preheat oven to 250°F and preheat waffle iron. Whisk together flour, sugar, seasonings, baking powder, baking soda, and salt in a large bowl. Whisk together buttermilk, melted butter, and eggs in another bowl or measuring cup, then whisk into flour mixture until just combined. Brush hot waffle iron lightly with vegetable oil and pour a slightly rounded 1/2 cup of batter into each waffle mold. Cook waffles according to manufacturer's instructions until golden and cooked through, about 3 minutes. Transfer as cooked to rack in oven to keep warm, keeping waffles in 1 layer to stay crisp. Repeat and make more waffles. Fun intro...I'm going to have to check out Gilmore Girls...and now I know what to do with my Biscoff. Yum! I love to watch Gilmore Girls too! And I can't believe that there is biscoff in this chicken! Nice idea! Oh girl! I need this stat. I felt like you were describing me in that post haha well except for the tv shows...as I feel we might have different taste as I never watch though lol. And this is totally a good use for the Biscoff! Looks delicious! I have been living in the South for almost 2 years now and I have yet to eat Chicken and Waffles. Might need to break that streak now! Nikki you have outdone yourself with this chicken! So since I'm afraid to fry at home, I'm just going to visit and have you make it for me. Sounds good? I'll bring the biscoff! p.s. I've been watching Gilmore Girls almost everyday too. I'm hooked now that it's on netflix! Yes, please! I adore chicken and waffles and you've added a whole creative twist to an old classic. Nice recipe!